At the Pinang Peranakan Mansion, the typical home of a rich Baba of a century ago is recreated to offer a glimpse of their opulent lifestyle and of their many customs and traditions. 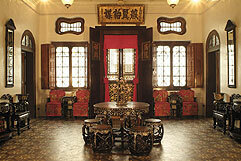 With over 1,000 pieces of antiques and collectibles of the era on display, this Baba-Nyonya museum is also housed in one of Penang’s heritage mansion of eclectic design and architecture. Built at the end of the 19th century by one of local history’s famous personalities, the ‘Hai Kee Chan’ or Sea Remembrance Store had once served as the residence and office of Kapitan Cina Chung Keng Kwee. Though not a Baba himself, his Chinese courtyard house was much like a typical large Baba home of eclectic style, incorporating Chinese carved-wood panels and English floor tiles and Scottish ironworks. Having survived the many decades of neglect and decay, the mansion has now been restored to its former glory of a stately home. Complimentary conducted tours are only available with prior arrangements for a group of 5 persons and above. All rates are subject to change without notice. Discounts are available to school bookings and other large groups. Contact us for prior bookings and more information to enjoy these special rates. Security cameras are placed all over the mansion. Please refrain from touching any display items. Food and drinks are strictly prohibited in the mansion. Videography and photography are not allowed within the mansion. Any use of photographs or video clips for commercial purposes without the express written consent from the Management is strictly prohibited. The Mansion and its grounds are available for private gatherings and events. Contact us for further information and attractive rates. 29, Church Street, 10200 Penang, Malaysia. Managed by Pinang Peranakan Mansion Sdn. Bhd. 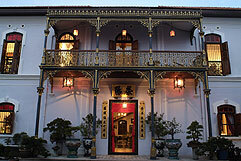 Copyright © 2004 Pinang Peranakan Mansion. Managed by Pinang Peranakan Mansion Sdn. Bhd.